We have built a lot of websites over the years! 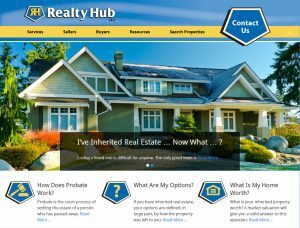 This is a WordPress website for a real estate broker in Minnesota. He specializes in helping families sell homes that they have inherited. The court process for this is called “probate”, which should explain the name! The goal of the site is to position the company as experts in the field of probate. A lot of articles were created to do this, and we are using WordPress to manage all that content. The design process for this site was very interesting. The client has a strong design background and provided many of the elements used on the site. The logo and the inverted pentagon motif came from him. The layout and other graphical elements came from our design team. This was a case where the client really did not have a clear vision in his mind of what the site should look like. In situations like this, what usually works is for our design team to just come up with some samples, let the client choose their favorite and go from there. That is what worked in this case. After several rounds of changes, we got to a design that the client loved. From there, it was a matter of creating a WordPress theme that matched the design and adding the content. 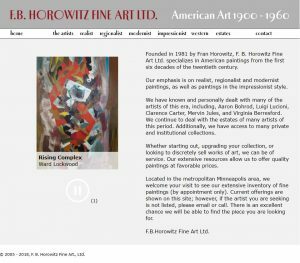 FB Horowitz deals in original paintings by American artists. When they came to us, they had someone who would update their website on a regular basis. They wanted to have their full inventory of paintings on the site, so that meant a lot of updates! Any time a work of art was bought or sold, they had to pay someone to either put up or take down that page. We knew there would be a better way. Why not have a database driven website that you can update yourself? Clearly, this would save time and money. What’s more, by being clever about it, all the paintings could be cross-referenced by artist and genre. This would make it much easier for an art collector to find what they are looking for. At first, the client was skeptical. It sounded like a lot of work to have to upload all those files. They had a big vacation planned in a few weeks, and they weren’t sure they could get everything uploaded in time. The day after the site launched, the client paid a surprise visit to our office. Because the tools we provided were so easy to use, their whole inventory was uploaded in half a day! Work smarter, not harder, we always say. Not surprisingly, this site hasn’t won any awards for its visual appeal! For the record, the client liked the look of DigiKey.com, another electronics supplier, so that was the model. In any case, the story about this website isn’t about design anyway. It’s about functionality. 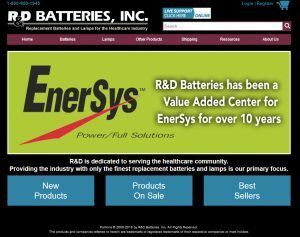 R&D Batteries sells batteries (duh) into the medical industry. All the electronic devices you find in a clinic or hospital contain an onboard battery backup. That way, no matter what happens to the power to the building, everything keeps working. Since a lot of these machines keep people alive, it’s pretty important that they do that! Some of the batteries that are used in these devices are very unique. In fact, R&D carries over 3,000 different batteries! Many of them are specific to only one device. Some can be used in multiple devices. The challenge for the R&D customer is finding the right battery for the right device. This is where the website comes in. Every one of their batteries is cross-referenced to every device from every manufacturer that it works in. So when some hospital employee needs a new battery for a particular device, they can just look it up! The website knows what battery goes in it, and in a couple more clicks, they have it ordered. The website also integrates deeply with their accounting system. Customers who get discounted pricing can log in and see their discounted pricing. They can review past orders, pick their shipping destination from a drop down, etc., etc., etc. There’s actually so much functionality built into this website, it’s hard to talk about all of it without it getting boring. Every single feature benefits the customer, though. It makes it easier for them to shop at R&D batteries than at R&D’s competition. That’s the name of this ball game. 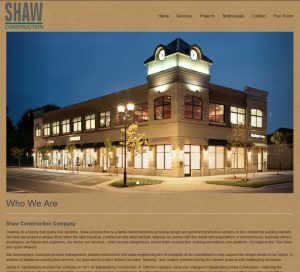 Shaw Construction is a commercial builder in the Twin Cities. The look of their website is made to match their most recent brochure and other marketing materials. The background image is actually made from a scan of the very rough paper that they used. The site utilizes a responsive design so it looks just as good on phones and tablets as it does on a desktop or laptop computer. There are some behind the scenes tools that help make their life easier, and easier for their subcontractors as well. It’s their online “Plan Room”. The Plan Room has pdf files of all the drawings for all their upcoming projects. When a subcontractor wants to submit a bid, they simply log into the plan room, access the files they need and they are off and running! No paper wasted. No time wasted either. Just another way that web technology can solve problems for people. This website was built for speaker, bestselling author and marketer extraordinaire, Perry S. Marshall. It was built to support his book, 80/20 Sales and Marketing. Most people are aware of the Pareto Principle or 80/20 rule. 80% of your revenue comes from 20% of your customers, etc. In that book, Perry points out that there is much more to 80/20 than that. There’s not just the 80 and the 20. There is a continuous curve that has that 80/20 property not just in one place on the curve, but all along it! For more information on that, go buy the book. You will be very glad you did. 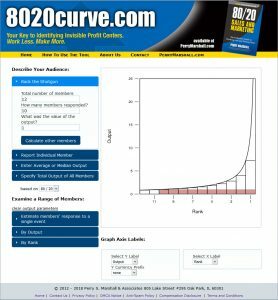 For those who fully grasp that larger 80/20 concept, the tool on 8020curve.com can be used to make very accurate business predictions. For example, if you know you have 1000 people who bought your $10 thing, you can accurately predict how many people will buy your $100 thing. You might want to know that before you spend a lot of time and energy producing that $100 thing! Again, buy the book to learn more about how to use this tool. You will find it jam packed with other valuable business insights as well.